It’s 17th December already, so only a week until Christmas Eve (sorry to panic you!). I do hope you’re having a wonderful festive season so far. 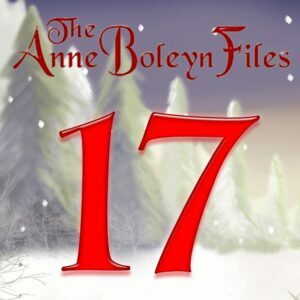 It’s time for another Tudor treat from the Anne Boleyn Files Calendar! Today’s treat is from author Sandra Vasoli and it’s a lovely musical one. I won’t spoil it by saying anything further. Simply click on the number 17 here to enjoy it. Do remember that you can go to the Advent Calendar at any time of day by just clicking on the link in the cover image at the top of this website. The other 16 treats are still there for you to enjoy, if you need to catch up. The words are very sombre and sad. Perhaps at that time it was seen more as a celebration that Herod was unsuccessful in his attempt to kill the baby Jesus? Or were people much more morose at that time? Very interesting though. How very very sad, yet beautiful to, I don’t think many carols have survived from Tudor times, I can see the pageants being enacted round the country and at court, rich and poor listening to this mournful little carol and those that were mothers and every women and men to, sharing a thought for those that had lost their innocent babes, their grief would have been overwhelming, I think it’s only right to, to share a thought for those who have lost children around the world and are still losing them due to disease war, genocide famine etc, and because this is Anne Boleyns website for Henry V111’s second wife and Katherine of Aragon especially whose fortunes would have been so different had her son’s lived. That is very beautiful. Thank you for posting it. Beautiful and haunting thank you very much Roland. So haunting and so beautiful. Thanks Sarah and Roland for these moving posts of the cry of the mothers as their children were slain by King Herod who by this time was completely mad and insane and ordered many such murders in his last years. “A voice was heard in Ramah of painful crying and deep sadness: Rachel crying for her children. She refused to be comforted, because her children are dead.” Gospel of Saint Matthew , 2: 18 the quote is from the Prophet Jeremiah 31:15 which refers to the massacre of the innocent children. It also talks of exile and return and redemption. It is a beautiful carol, very moving, very captivating of the anguish of a mother saying farewell to her dying child. Thank you.